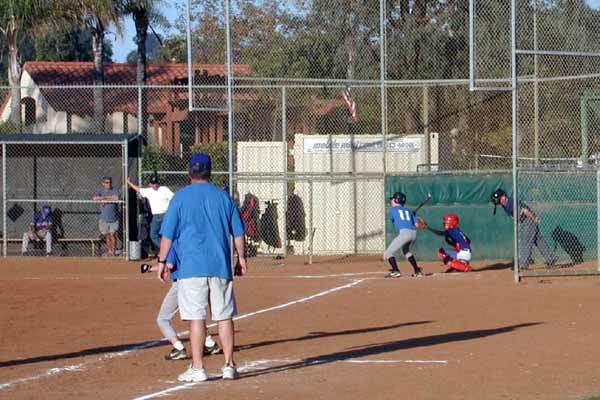 "Travel ball" is the antithesis of recreational sport leagues. 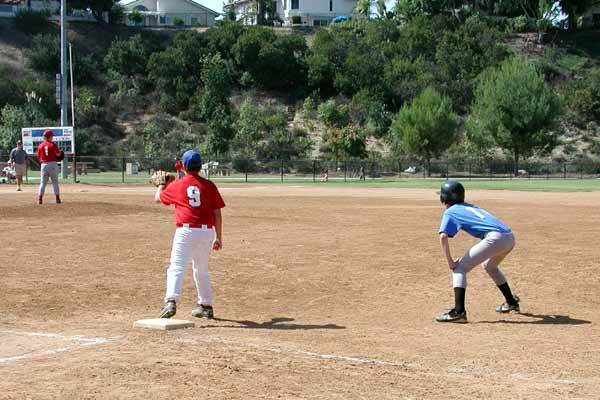 Where rec leagues, such as Little League for baseball, allow anyone to participate and have minimum playing time rules, travel ball is competitive with tryouts to make the team and no guarantees about playing time. 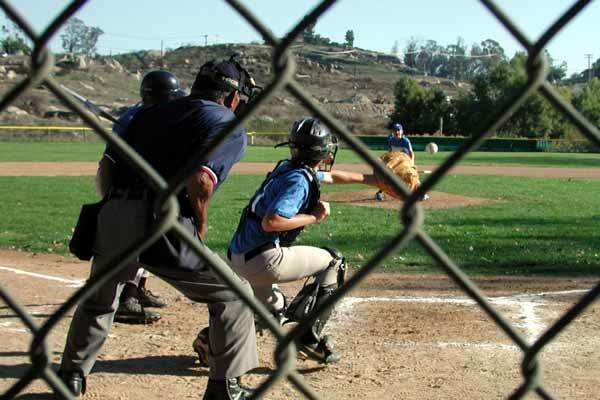 Where rec leagues are staffed by volunteers, travel ball coaches are generally paid professionals trying to make a living. 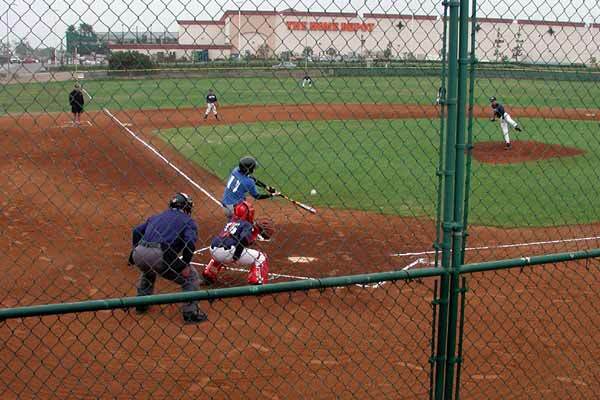 While we have come to think of travel ball as competitive baseball, there are generally competitive teams for any sport for which there is a rec league. 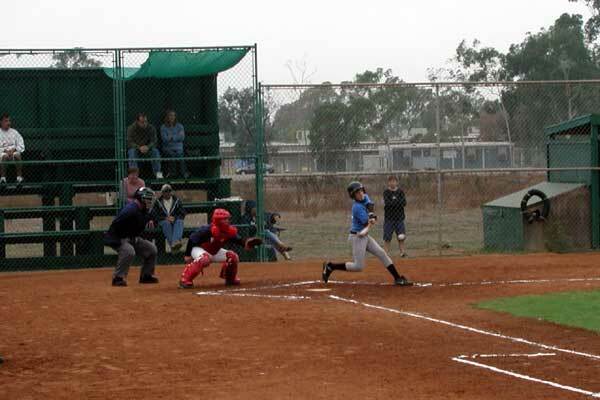 The term "travel ball" implies that the team has to travel to other communities to find worthy opponents. Brad is currently on a competitive basketball team. 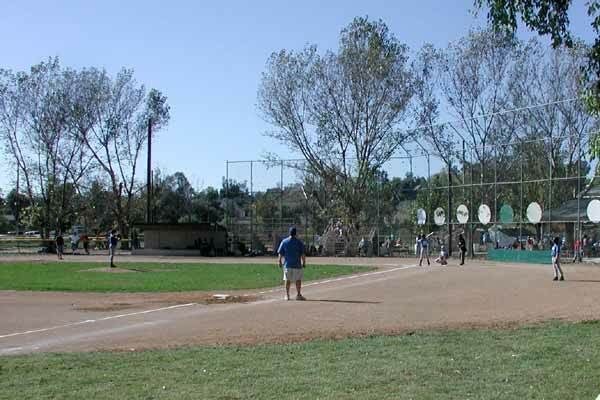 "Winter ball" is the term for the off-season recreational baseball season, played during the fall, not the winter. (Off season soccer is called "spring soccer" and is played in the spring.) Since off-season sports programs are designed to allow concurrent participation in the in-season sport, the games are on Sundays and the practices are slim to non-existent. Brad just completed a Winter ball season. Ironically, Brad's basketball travel team never travels, playing all their games at a single facility to which all the teams travel to play, and Brad's winter ball baseball team did more traveling than any team he's ever been on before, because the league had to expand beyond the local community to draw enough teams. This page chronicles his travels this season. Home was the misleadingly named Views West field, misnamed because it is surrounded on three sides by canyon walls and the only view is down the canyon to the south. 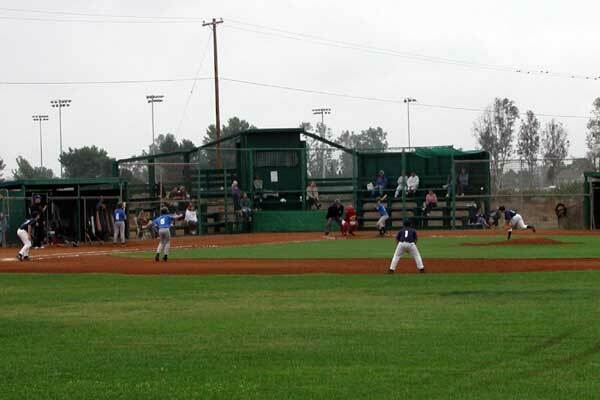 This was the home field for regular season Pony baseball last spring, too. 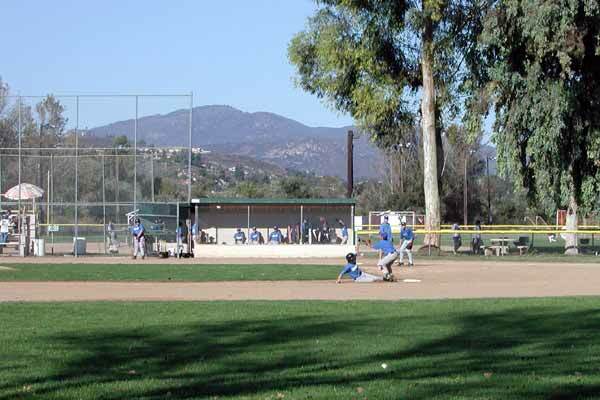 The Winter ball team played more than half of their games here since games against the other Penasquitos teams naturally were played here, whether Brad was home or visitor. 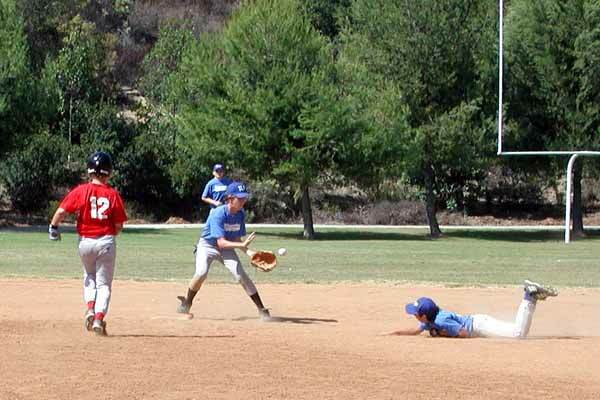 Brad played a lot of short stop and catcher, his favorite two positions. He pitched once or twice. 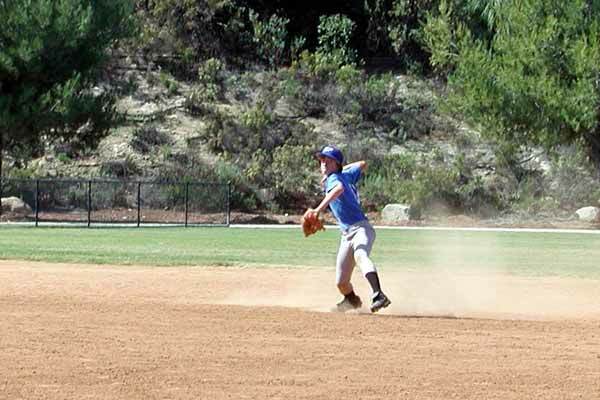 He had a much more successful Winterball season than last spring's regular season: then he was a 13 year old playing with 13 and 14 year olds; now he is (almost) 14 and playing with boys his age and a year younger. He should have a very successful season this spring. Brad was a leader on this team, much more so than last spring's regular season, again probably because of the age and skill level bit described last caption. 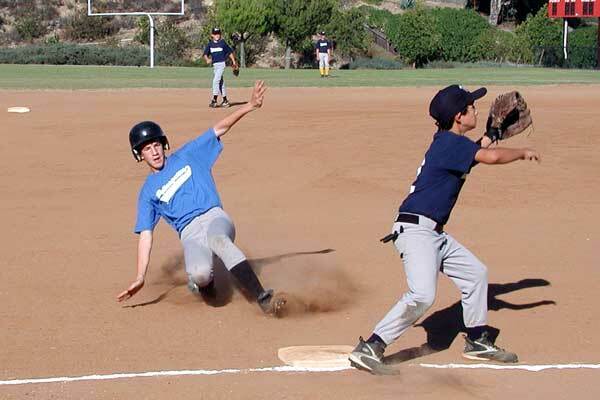 Brad beats the throw, stealing third. Brad admits he's not using his right hand correctly. 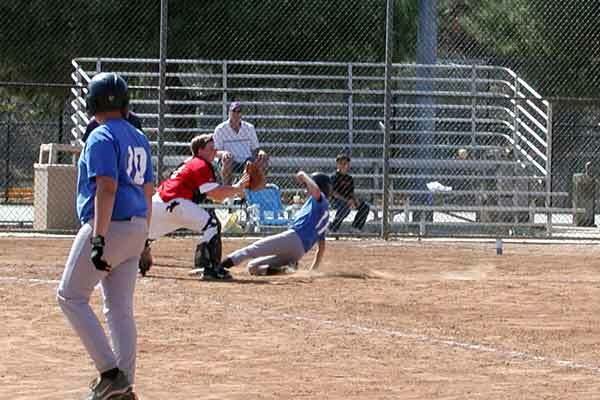 Brad slides into home ahead of the throw while a teammate in the on deck circle eclipses the umpire. While this looks like Home Depot field (or perhaps the Orange Monster in left center?) 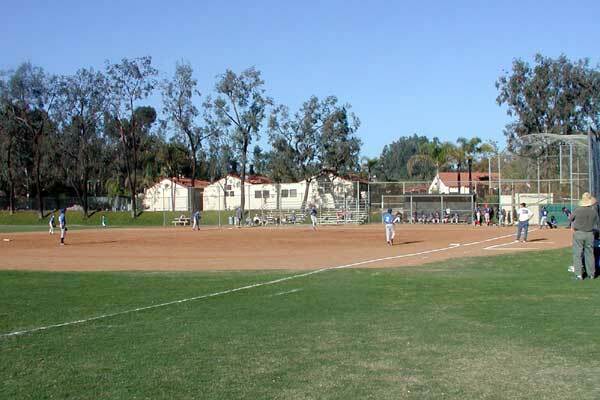 it's really one of several ball fields in Mira Mesa. 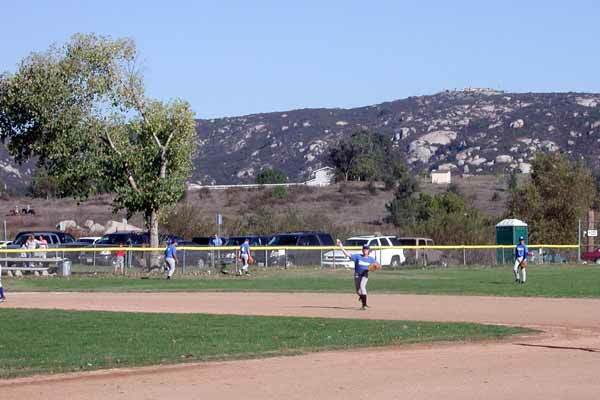 Mira Mesa is the next community south of Rancho Penasquitos. We lived there for four years before moving to Penasquitos. 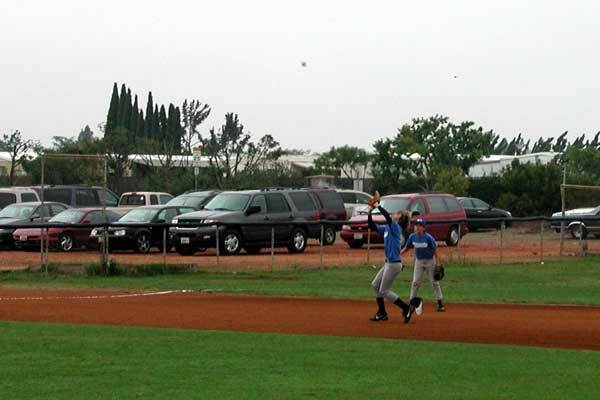 The Home Depot and these ball fields didn't exist when we lived here. Brad at short losing his hat while catching a pop up. Parking was plentiful and close by. 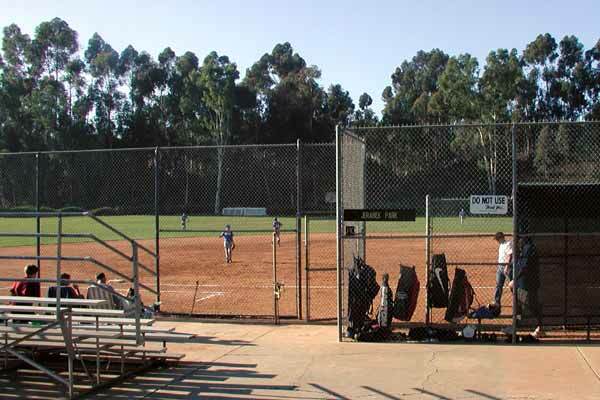 The Mira Mesa fields had the most elaborate stands of any of the fields. That's Kristi watching Brad bat from behind home plate in front of the scorer's booth. While the fields were immaculate inside the fences with dark green grass and clean brown dirt, the area immediately outside the field, even where the fans walked, was desolate and unkempt. Doug watches his brother bat. There's a reason Ramona has become a bedroom community to San Diego: it's very pretty up here. 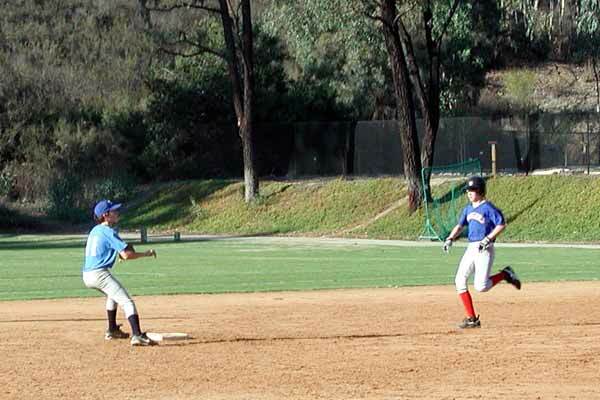 Here Brad beats the throw into second in front of the visitors' dugout, huge eucalyptus trees and the Cuyamaca Mountains. Brad at short warming between innings. This was the biggest fenced field they played on. (Views West has no outfield fence.) Note horses to extreme left in picture. 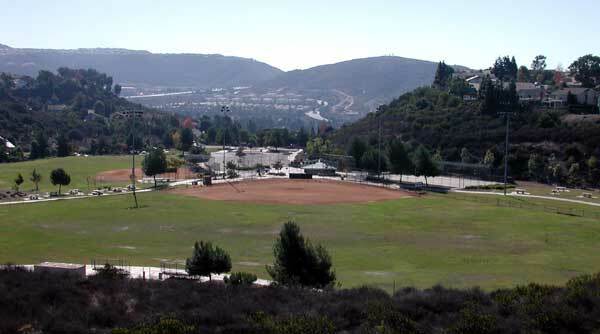 Jerabek Field is not very far away from where the 2003 wildfires destroyed many homes in Scripps Ranch. Scripps Ranch is in a grove of eucalyptus trees (as evident here) that are quite flamable. Brad waits in vain for the throw from the catcher that never came. Apparently Brad thinks this pitch is outside, because he's not swinging and it's a strike otherwise.